Little Zombies: Princess for Hire: Where do I sign up? Princess for Hire is the first book in a series. Did I read it first? Nope. My library hadn't shelved this book in yet. Book two The Royal Treatment, however, was mine on hold. (Nice fresh crisp copy.) I couldn't wait for this one to be ready, and so I read book TWO first! I wouldn't suggest doing that. Well, not if you think you'll end up LOVING the series. You really have to do it the right way! Read in order! That said, I really liked this book. And the only reason why I would rate it 4 bites out of 5, is only because I read it second. I knew what was coming. And I was just wanting it to get to that scene. I wanted to get to that point. But I still enjoyed the book. But I think I like the second even better. But I could be biased since I did read it first. Pricky teases for me liking books about princesses. Whatever! I guess I just like fairytales! She's the odd one, right? Anyway I thought Desi was going through jobs so quickly--one right after another, whereas in book two I didn't really feel that way. It seemed almost unrealistic. Yeah yeah yeah there's bubbles/princesses-for-hire fake thing going on, but still--it seemed TIRING for Desi. How is she not zombie exhausted? I did wish that we could hear more about her home life-but that's only because I KNEW what was going to happen! Again-don't read book 2 before book 1. Just don't. Anyway, still liked the book! I'll be looking forward to book #3! Hungry for a copy? 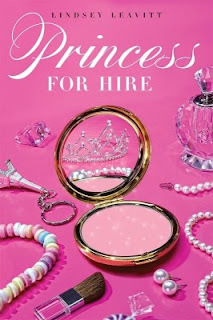 Princess for Hire is now available at booksellers everywhere. P.S. Labeled also as "life-swap" but it's not technically swapping, but a one-say swap!